Tuberculosis (TB) causes thousands of deaths every year in South Africa and the rest of the world. To help stop the spread of the disease, the World Health Organisation (WHO) started a new plan called the Global Plan to Stop TB 2011-2015: Transforming the Fight - Towards the Elimination of Tuberculosis. The number of people who die from TB rises worldwide every year. The new and improved plan is action oriented. It will run from 2011 to 2015 and its main aim is to save more than five million lives in the next five years. The plan will improve TB research to help the development of rapid TB tests, faster treatment plans and more effective vaccines. South Africa has one of the highest TB rates in the world. 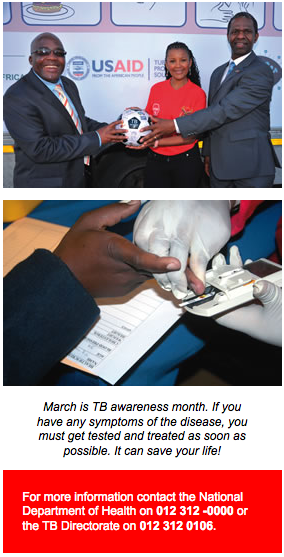 Government has therefore accepted the responsibility of increasing the fight against TB, as well as HIV and Aids. South African TV personality Gerry Elsdon is an ambassador for the TB campaign, as well as an advocate for the International Federation of the Red Cross and Red Crescent. Gerry was diagnosed with tuberculosis of the womb nine years ago and fights for the rights of people affected by the disease. Finding out she had TB prompted Gerry to learn more about the disease. She learnt that it is a curable disease and that treatment is available free of charge at all public health facilities. She then decided to educate others about what can be done to fight TB. Research has shown that thousands of TB cases become almost five times more severe than it should be due to HIV and Aids. Antiretrovirals (ARVs) do not cure TB and TB drugs don’t cure HIV. This is why it is very important that people should know their HIV status and to get tested for TB and HIV regularly. STOP TB - BECAUSE I CAN! I will ensure that my actions do not affect TB patients negatively.